Health & Wellness: What is the most important part of your job? 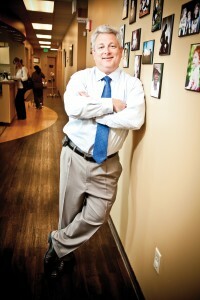 Dr. Volin: Having healthy outcomes for both of our patients: a healthy mom and a healthy baby. Health & Wellness: What motivates you to stay with NSMC? Dr. Volin: Not only does North Suburban have the most up-to-date infrastructure and monitoring systems; we also have lovely private, postpartum rooms and the most outstanding, compassionate nursing staff in the metro area. Health & Wellness: What are the main attributes you would look for in a birthing hospital? Dr. Volin: The quality, compassion and empathy of the labor and delivery and postpartum nursing staff. Health & Wellness: How does NSMC exemplify its commitment to healthy families? Dr. Volin: Many women have breastfeeding issues after delivery, and the lactation services here are available for all patients, even after they’ve delivered and gone home. Health & Wellness: What seems to be a favorite amenity at NSMC? Dr. Volin: I think mothers and fathers both appreciate being able to get meals while staying in labor and delivery and postpartum units. That way, no one has to worry about going out and getting food, and they can stay together the whole time and enjoy their new family. Hi this is Carmen. I just wanted to say thank you for delivering my baby! It was a pleasure meeting you. Jeje and i really liked how you treated us. Our baby is so healthy, thank you so much….